Join Bill Peach Journeys and discover the quintessential Japan during this 10 day journey exploring the highlights of the “land of the rising sun”. Experience the fast paced bright lights of Tokyo to the idyllic countryside crowned by Mount Fuji and spectacular mountain scenery. We will travel by Shinkansen (Bullet) train and tour some of Japan’s most impressive temples and shrines. We will visit the iconic red floating Torii Gate and the Itsukushima Shrine on Miyajima Island. In Hiroshima we visit the moving Peace Memorial Park then on to Osaka to visit Himeji Castle. Ideally located and stylish accommodation throughout assures a quality journey with every comfort. An inspiring Japanese discovery awaits those who wish to experience the essence of Japan! Arriving into Tokyo, a private transfer awaits to transport you through to your luxury hotel, the award winning Conrad Hotel Tokyo. Ideally located, this iconic hotel is a statement in contemporary luxury providing the perfect base from which to explore this extraordinary city during your day at leisure. Japan’s alluring capital completely enchants those who love to immerse themselves in destinations of great depth – where soulful cultural traditions seamlessly meld with ultra modernity. This evening meet your Journey Director and fellow travellers for welcome drinks. This morning is a guided Tsukiji fish market tour, exploring one of the world’s largest seafood markets and learning about how seafood is used in traditional Japanese cuisine. You will next participate in a sushi-making lesson. Under the guidance of a local cook, learn to prepare rolled sushi, nigiri sushi and other variations, then enjoy your creation! In the afternoon we explore Asakusa, a part of Tokyo’s Shitamachi (old town), one of the city’s oldest Geisha districts and visit one of Japan’s most colourful and popular temples, Sensoji. Later we take a scenic river cruise on Tokyo Bay to Hinode Pier. Tonight there will be a formal welcome dinner. Today we drive to Nikko for a full day of sightseeing. We visit the Toshogu Shrine, a UNESCO World Heritage Site which is the final resting place of Tokugawa Ieyasu, the founder of the Tokugawa Shogunate that ruled Japan for over 250 years. Nikko is also famous for spectacular scenery such as Lake Chuzenji and the Kegon waterfall, all sights we will visit today before returning to our hotel. Departing Tokyo, our journey continues to the idyllic countryside location of Hakone, crowned by Mount Fuji and stunning mountain scenery. Upon arrival we board the famed replica pirate ship that cruises along Ashinoko Lake, a body of water that was formed after a volcanic eruption that occurred more than 3,000 years ago. After our lunch we ride the Guinness World Record-holder ropeway all the way up to Mt. Owakudani, passing over sulfurous fumes and hot springs. From the mountain, take the ropeway bound for Togendai. Check in to our exceptional accommodation, Hakone Kowakien Tenýu Ryokan and enjoy the traditional elegance of a ryokan stay accented with modern luxury. After breakfast, for those interested, there is a chance to soak in an Onsen, a traditional Japanese hot spring. Our journey continues today to Kyoto by Japan Rail Shinkansen, a bullet train in first class. Running at speeds of up to 320 km/h, the Shinkansen is known for punctuality (most trains depart on time to the second), comfort (relatively silent cars with spacious, always forward facing seats), safety and efficiency. Home to an astonishing 2000 shrines and temples, here in Kyoto you will explore the beautiful Kinkakuji-temple (Golden Pavilion); originally built as a retirement villa for the Shogun, after his death it became a Buddhist Temple. We also visit the Ryōan-ji (Rock) garden which is considered one of the finest surviving examples of kare-sansui (dry landscape). This refined type of Japanese Zen temple garden design generally features distinctive larger rock formations arranged amidst a sweep of smooth pebbles raked into linear patterns that facilitate meditation. We also visit the famous Philosopher’s Walk, often ranked as the best viewing spot for cherry blossoms. We transfer to our hotel, the award winning Kyoto Hotel Okura noted for its elegance and warm hospitality. A full day sightseeing today including a visit to the UNESCO World Heritage Site, Todaji, in the city of Nara. Its Great Buddha Hall houses the world’s largest bronze statue of the Buddha. We visit Nara Park also known as Deer Park which is home to hundreds of freely roaming deer, considered in Shinto to be messengers of the gods. Nara’s nearly 1200 deer have become a symbol of the city and have even been designated as a natural treasure. We visit the Kodaiji Temple, an outstanding temple in Kyoto’s Higashiyama District established in 1606. We return to our hotel this evening. Continue your exploration of Kyoto today. We begin by transferring to Kameoka to ride on the scenic train to Arashiyama, famous for its beautiful scenery and the bamboo forest. Today we have an immersive Japanese cultural experience as we dress in traditional Kimono and take part in a Japanese tea ceremony in a machiya house (traditional Japanese house) followed by a discussion about the nuances of these practices. Our journey continues today to Hiroshima by Shinkansen. We will visit the moving Peace Memorial Park and Atomic Bomb Dome. The area where the park now lies was ground zero for the atomic bomb on 6th August 1945 and holds many memorials, monuments and statues. Here we will see the Childrens Memorial, Peace Bell and Eternal Flame. The main attraction of the park is the Peace Memorial Museum that poignantly depicts the history of Hiroshima. Later, we take a ferry to the small shrine island of Miyajima. This island is home to the world renowned red floating Torii Gate that leads to the Itsukushima Shrine. This morning, we head to Osaka, Japan’s third largest city by Shinkansen. On arrival, we visit Himeji Castle, a hilltop Japanese castle complex regarded as the finest surviving example of prototypical Japanese castle architecture. The largest castle in Japan, it is one of Japan’s first UNESCO World Heritage Sites. After lunch, you may walk in the castle gardens and see beautiful peach trees. This afternoon, we check in to our hotel and have some time at leisure to explore or relax. Tonight, our farewell dinner will be an authentic Japanese dinner to celebrate the conclusion of a wonderful adventure. Enjoy the facilities of the hotel before transferring to Kansai Airport to board your flight home taking with you fond memories of an unforgettable Japanaese discovery. Our worldwide collection of journeys are operated by a select number of preferred travel partners who we have chosen because of their expertise within special regions and who combine the same style and superior level of service that has become synonymous with Bill Peach Journeys. Each of the worldwide journeys has a Bill Peach Journeys stamp of quality. 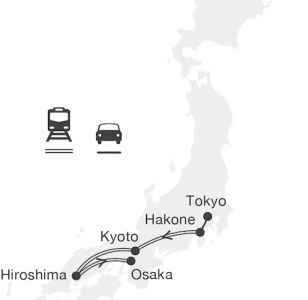 Shinkansen (Bullet) train & coach travel. Flights from your home port to Japan are not included in the journey price. Should you require flights to and from Japan, we can provide a competitive quote on airfares and pre and post tour accommodation in Japan, at the commencement and conclusion of your journey.